Application of a non-invasive comfortable light beam on the skin, instead of needles, to stimulate acupuncture points to clear energy stagnation and activate REJUVENATION of blood flow and qi (life force) in the body. The non invasive use of laser light, phototherapy, is a safe, painless, and effective alternative to metal needles to stimulate acupuncture meridian points. Fear of needles is very real, and will often cause potential patients to reject even the idea of acupuncture treatment. 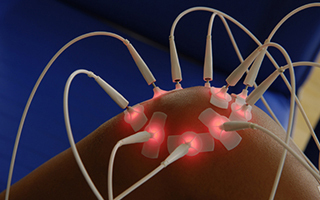 Laser acupuncture can treat points that may otherwise be difficult to treat, due to age, sensitivity or fear. The needless laser beam makes the treatment noninvasive, painless, aseptic, and significantly reduces pain, anxiety and fear associated with traditional acupuncture needles. Effectiveness of Laser acupuncture is enhanced because when light is received, it is transmitted though out the body. When a laser beam is applied, light travels under the skin to enter an acupuncture point. The light continues to travel through the median and to other acupuncture points. The light can be detected in other places other then where the beam was directed, along the meridian and other acupuncture points with a sensitive photon detector. This finding possibly suggests that our body may contain a fiber optic network of energy channels. Advanced brain imaging indicates like traditional acupuncture, laser acupuncture not only has positive local physiological effects, but also in the brain. Recommendation: 10-12 sessions for best results, and combined with medical cupping.